First horse in front is War Farr (won the Wagga Wagga Cup in 1930) with Jim Smith. Steam Boiler being taken to Stinking Creek, Stokes Copper Mine at Goobragandra near Tumut. 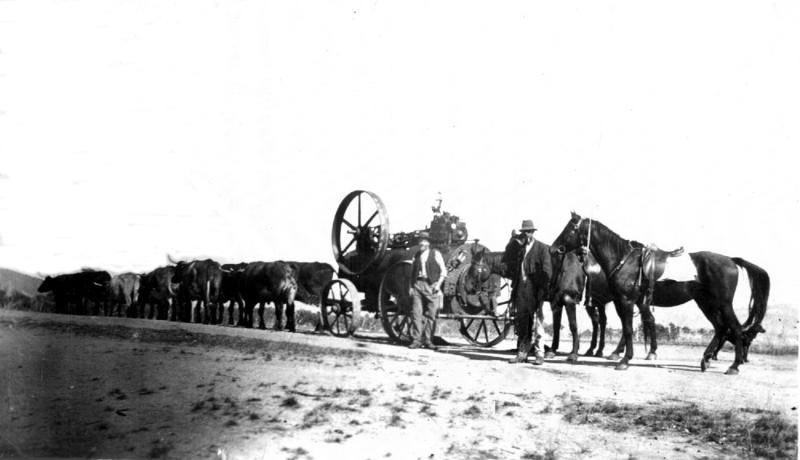 Dan Frenchs bullock team. Man in front of steam boiler is Dan French. William (Bill) Clarence Butler and Dan French were both involved in taking the boiler to the mine. First horse in front is War Farr (won the Wagga Wagga Cup in 1930) with Jim Smith. Steam Boiler being taken to Stinking Creek, Stoke’s Copper Mine at Goobragandra near Tumut. Dan French’s bullock team. Man in front of steam boiler is Dan French. William (Bill) Clarence Butler and Dan French were both involved in taking the boiler to the mine. The boiler is still at the mine.